When the Berentzen ApfelKorn comes out, the party can get started! Berentzen ApfelKorn has been one of the most popular party drinks in the Netherlands for decades and it's hard to imagine a party without it. Many devotees became acquainted with ApfelKorn during their winter sports holiday and enjoy reliving their après ski experiences. ApfelKorn is also very popular during the Dutch Carnival season. Fill a long drink glass with a few ice cubes. 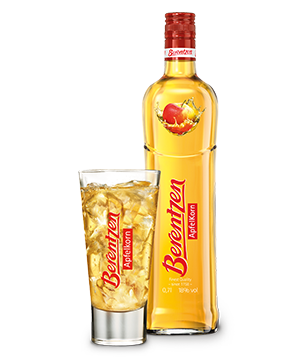 Pour 3.5 cl of Berentzen ApfelKoren over the ice cubes and fill with sparkling water. A perfect bubbly party mix. Also delicious as a cold shot when drinking with friends. The original Berentzen ApfelKorn, made according to family traditions, has a fresh and sweet flavour. A 14.5% alcohol variety of this Berenzten ApfelKorn has been produced especially for supermarkets and events. A 2-cl miniature version. Ideal for events and designed for portability. The Berentzen minis are packed in 10s. Berentzen Peerkorn, ApfelKorn’s little sister, is slightly sweet and has a natural fresh flavour.